Trying to fit the TV in a small space? We've got a gorgeous corner option available in solid pine wood. 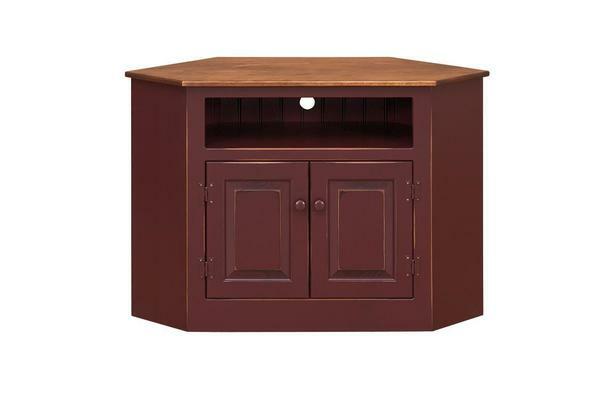 The Pine Wood Corner TV Stand has lower cabinet storage, an open shelf for your media player and room on top to hold a TV up to 42" wide. This pine wood furniture is made by hand in Pennsylvania. If you love the worn, antique look, you can get it with this custom TV stand. We offer light to heavy distressing for this pine furniture. Amish craftsmen customize your furniture, adding pin holes and gentle nicks, as well as a rubbed finish or even simulated cracks, depending on the level of distressing you'r looking for. Stain and painted finishes are also available. Order online or give us a call or email today. We can't wait to start working on your new pine furniture. Thank you for shopping at DutchCrafters.